Most would agree that the aroma of high quality coffee is simply magnificent. Even people who are not fond of drinking coffee tend to like its scent. 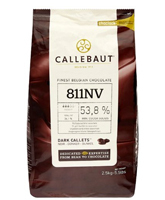 Desserts made with coffee extract have an aura of luxury with at the same time being uplifting. Too bad that so many of the coffee extracts available on the market today, taste more like burnt caramel than actual coffee. 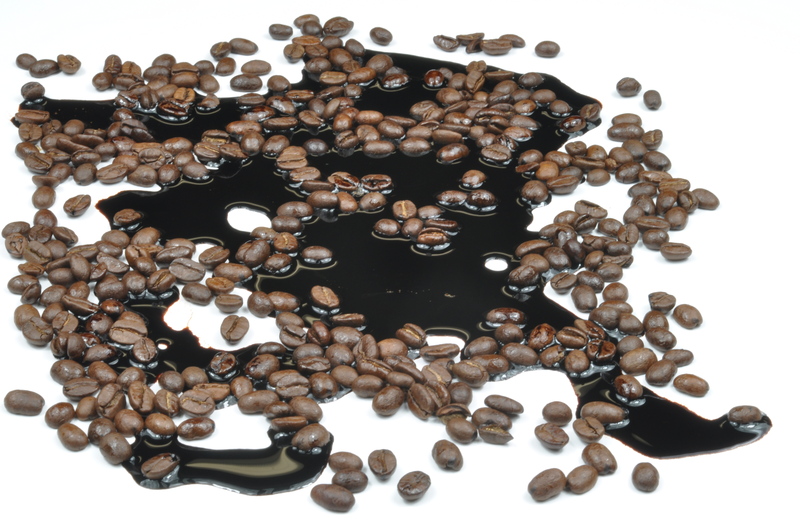 To make your own you coffee extract you will need good quality coffee, some artisan coffee merchants make outstanding coffee and then certainly some large companies do as well. 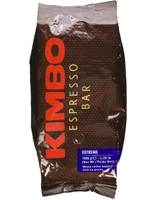 There is an amazing Belgian coffee which is rather difficult to purchase in many parts of the world and another favorite of mine is Italian Kimbo, Gold Espresso. These coffees (Or others, I assume there some good ones in your area) will make great tasting homemade coffee extract which will flavor your desserts to a higher level. 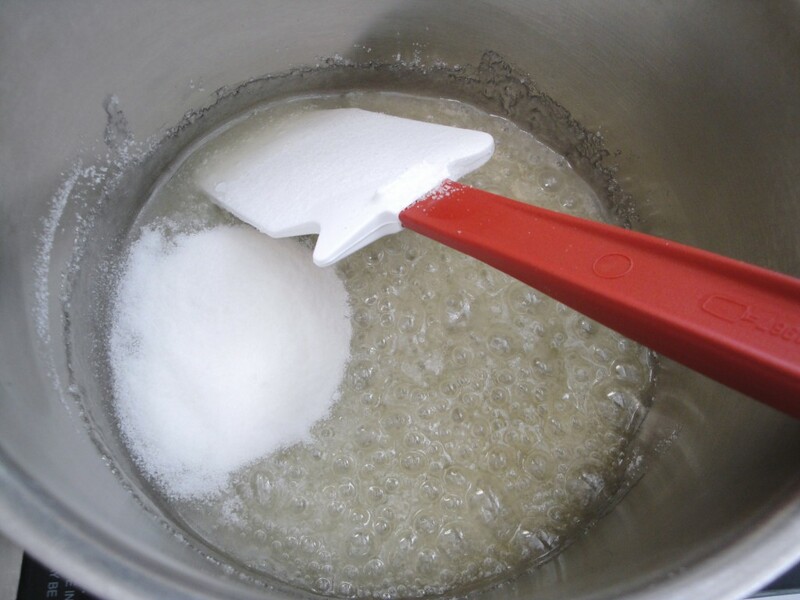 In a small saucepan bring the invert sugar to a boil. 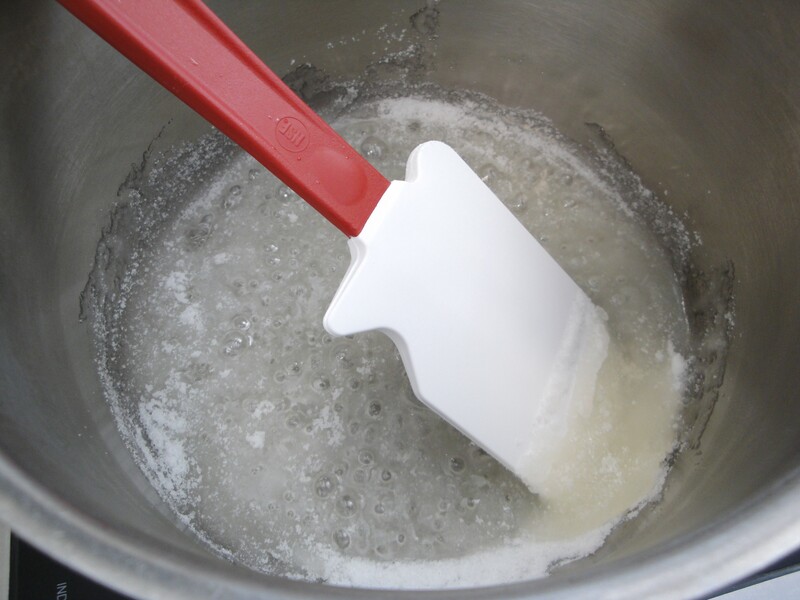 In small increments add the granulated sugar while stirring with a heat resistant spatula or wooden spoon. Once the previous added amount is melted add another small amount. Stir to a golden caramel. (Cook slightly darker than the photo). Deglaze the caramel with the boiling water, add the coffee grounds and the vanilla bean. Return to a boil. Remove from heat and cover with plastic. Allow to mature for 24 hours. Strain using cheesecloth and a chinois. I agree with you, most coffee extracts leave much desired. I have always wanted to know how to make homemade coffee extract, Thank you for sharing this recipe, it is much appreciated. Chef Eddy – great tip which I’m keen to use. How long would a product like this keep and what is the best way to store it? I assume from the high sugar content and loss of water from boiling it would keep a very long time – is the fridge an appropriate place to store? For sure Dimitri, hope it will be of use for you. It easily keeps over a month in a sealed container stored in the refrigerator. We had a blind taste test using a very popular brand of coffee extract to compare. the result showed that 45 people liked the homemade version and 6 liked the purchased one. It truly is amazing how some extracts do not taste like coffee at all, just mainly caramel. thank you Eddy for the recipe. Rudolf, the Belgians make a lot of excellent things. Thank you for sharing! Glad to learn how to make it on my own since I’m such a coffee “addict”. Also thinking of making a decaf for the benefit of those coffee lovin’ moms-to-be! Hi Chef, thanks for the recipe, I’m a great coffee addict so I can’t wait it. I have to admit, coffee extract is all new to me. I’m familiar with using instant coffee granules in chocolate recipes to intensify the flavor but never heard of coffee extract. Thanks again for sharing! I do enjoy a good cup of coffee but have never really been fond of foods that have the taste of coffee in the midst. Usually because it is indeed very strong. I would however like to use it because I know, like you said, that most people love it. I wonder like Savanna, if there is any way to use it without it being so overpowering other than just minimizing the amount you use. Also I would LOVE to know how to make other extracts! Is it the same process? 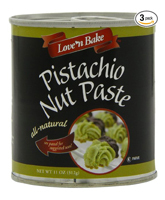 For example I use almond extract a loooooot because I just LOVE the flavor and scent and would love to know how to make it myself …that would be so cool!!! Can you freeze this and use it latter ? I was so excited to make this when I first read about it. I love desserts with coffee flavor! Can you substitute a good vanilla extract for the bean? I ask because the beans are so expensive. 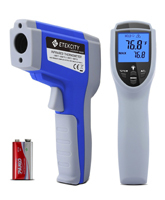 If so, would you add it after removing from the heat? First attracted to coffee when waking up in the morning to a percolator of dad’s Maxwell House or Eight O’Clock brewing! Enjoyed your discussion on coffee and intend to locate some Kimbo to try. Thank you for posting this recipe I can now make homemade coffee extract at home because I used different recipe to make from Internet and it didnt come out right. 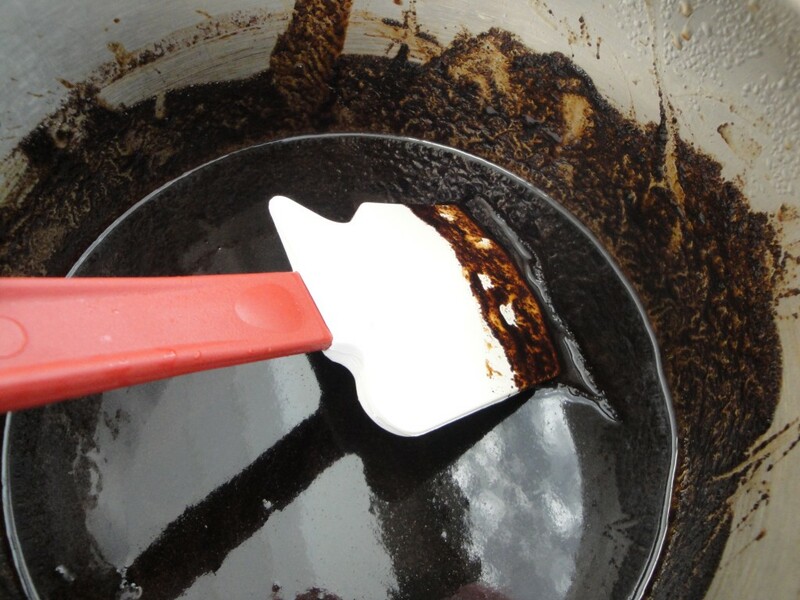 This homemade coffee extract seems real easy to make. How long can you store it? Definitely I will try to do it this weekend. I love coffee and I always buy the things that have this flavor. Now I will add the coffee extract to my favorite recipes. 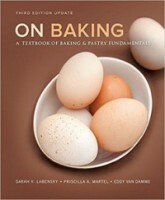 I am extremely excited to try this with my annual Christmas Devils’ food cake, :). I just hope the quality of beans I use are good enough. I have to agree I find coffee deserts luxurious and devine in taste and aroma. Thanks a lot for sharing! This is a first class recipe for coffee extract. I roast my own coffee so my extracts reflect the many flavor subtleties of the coffees I roast. The coffees come from many regions of the world. I recently extract from some El Salvadoran Bourbon cultivar beans using this method. I use coffee extract primarily for flavoring ice cream. I also use Tahitian vanilla beans. The results are astonishingly good. I never had good coffee ice cream until I started making my own with freshly roasted beans. We actually just made some Cappucino chocolate cookies today and was required to used espresso beans. And since we didn’t have any we used coffee extract and I was actually wondering if there’s a good recipe to make coffee extract. Thank you for this recipe! Much needed. 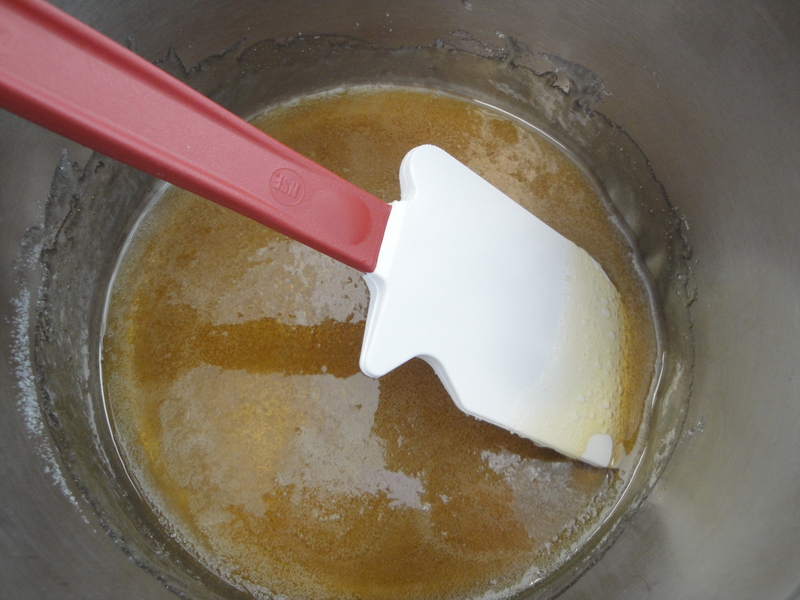 When you say to deglaze the caramel with the boiling water, do you add it all at once or pour in slowly while stirring? I’m a bit concerned that the caramel will splatter when the water is added. Or does the fact it’s boiling water stop that? I add it all at once. If you feel it is safer add about half to start with. However caramel will not splatter. 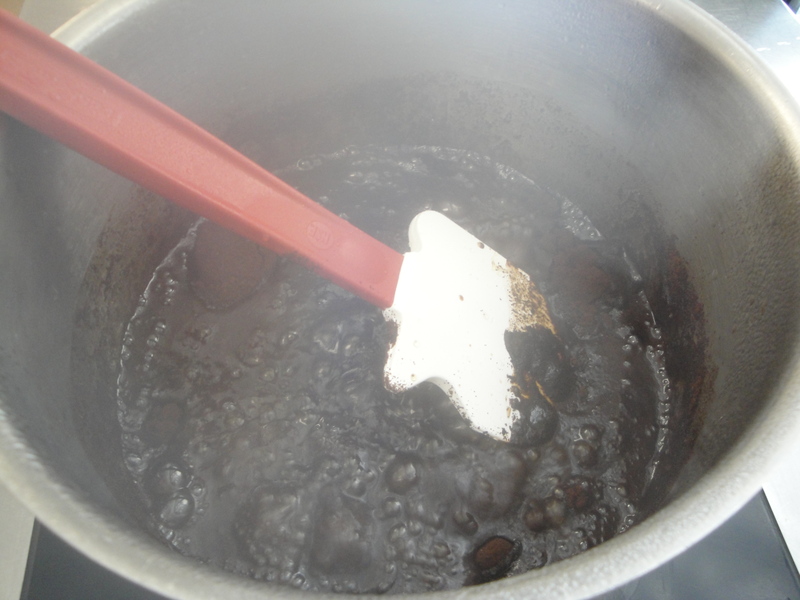 I had a lot of trouble making this – my caramel started to brown before I had half the sugar added, and when I deglazed with the boiling water I ended up with lumps of sugar in it, although I suspect that the sugar wasn’t all properly dissolved when I added it. Is the early browning likely to be because I’ve got a gas stovetop? Or just simply too much heat? In the end though, after straining the coffee granules out, I did end up with some amazing tasting Coffee Extract! I think next time I’ll add a tiny amount of water to the invert sugar to help with the dissolving. Thanks for the recipe, and the invert sugar recipe and information. The extract is brilliant. Can’t wait to make this! Didnt’ know we can’t make it at home instead of relying on store brought. Yay for anything home-made!!! Thank you chef! Can I use Splenda to make the invert sugar please ?